I would love to see the CGI of the five seasons re-done. With so many new meshes created for TLT, it would seem some of the heavy lifting it done already. Am I the only one who would gladly buy all five seasons on DVD again if the CGI scenes were modernized and re-rendered? It's a pipe dream, yes, but just curious how many people would re-buy. I figured that would be the case for a lot of people. I guess I'd just be interested in some kind of consistency - for example, by the time S4 came around, the CGI element made S1 look pretty made, making suspension of disbelief harder. I'm sure TLT will do to S4 what S4 did to S1. I'm with Jan, I'm fine with the CGI as it is, I certainly don't want to spend another $400+ to upgrade CGI. The CGI is currently somewhat distracting, especially when they couldn't improve the image quality on the composite shots but could improve the non-composites, leading to very abrupt shifts in quality -- but I don't watch B5 for the visuals. I also don't watch B5 for the visuals although I wouldn't mind seeing them touched up.I didn't really mind the Star Wars ones apart from the original Jabba scene and the daft tune they put at the end of ROTJ instead of the cool one but that wasn't even CGI. The Jabba scene sucked because it really didn't fit in anymore. 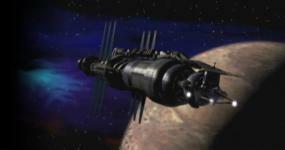 Re-doing B5's CGI actually removes one of its true claims to revolutionising TV ... the first show to use extensive CGI. If you take out that original, pioneering work and replace it with 21st Century CGI, you just make the show look like every other space show in the last 10 years. I prefer to enjoy B5 for what it is ... not what it might have been if it had been made 10 years later. Just like the Star Wars Special Editions. Love the originals, but the SEs are just "So what?". We all know the original trilogy was released in 1977, 80 and 83, so why introduce 1990s and 2000s elements to the FX other than "because they can". What I want to see is the original SW trilogy retouched -- just to clean things up, no crazy additions. Oh, and they can color Vader's lightsaber; they missed that the first time around. Unless they replace all Ewoks with Wookiees. That I would pay good money to see. I personally would love to see this done. Partly to remove the distracting element of the low-res space scenes, but mostly to get rid of the horribly compromised composite shots, and see them more like what was always intended. It's been discussed before, that te eventual release of B5 in HD would present an opportunity for this, indeed might even require it as the composite shots would look simply attrocious scaled up to HD, but with the massive costs, even with the TLT head-start, it doesn't necessarily look very likely. I agree with Garibaldi'shair, that I don't want the original messed with, in part because it was pioneering work. But, I also think raw_bean is on to something. Eventually, they will consider putting out B5 in an HD format. Right now, they are re-doing ST:TOS's FX shots. Of course, there are a lot less in that than in B5. It will come down to a simple equation: can they upgrade the CGI cheap enough to sell the HD product at a profit. I think that in a few years, the answer might be yes, but it would depend, in part, on how the popularity of B5 holds.